Trade liberalisation and the EU enlargement in the past two decades allowed European multinational enterprises (MNEs) to benefit from production fragmentation in Central, East and Southeast Europe (CESEE). Recent studies show that market regulations and standards that are embedded within Technical Barriers to Trade (TBTs) might not necessarily hamper trade but improve the quality of products, production procedures, and market efficiencies. However, complying with the regulations embedded in the TBTs imposed by a host country might be costly enough to discourage MNEs from investing there. Furthermore, MNEs from countries that impose more regulations and standards might be more capable of investing abroad. This article analyses how TBTs imposed by both home and host countries affect inward FDI stocks in the CESEE countries during the period 1996-2016. 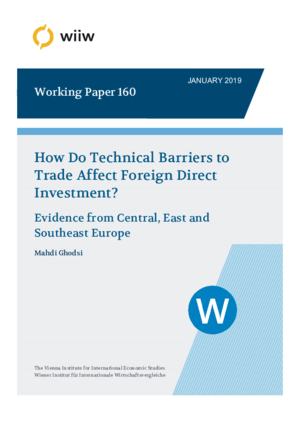 The results suggest that Specific Trade Concerns (STCs) raised on trade-restrictive TBTs imposed by CESEE countries induce ‘tariff jumping’ motives of investment to these countries, while regular TBTs as indications of positive externalities and efficiency gains at home discourage outward FDI. Besides, FDI stocks by non-EU28 countries are found to be stimulated by regular quality TBTs imposed by the host economies.